Among other things, Jeff Bezos' firm is selling a lot more private-label items and upping its Google ad spending. As expected, Amazon.com (AMZN - Get Report) appears to be having a stellar holiday season. What might be less appreciated, however, is how much the e-commerce giant has evolved in just a year's time. Data from research firms such as Hitwise and GBH Insights suggests Amazon accounted for a huge share of U.S. e-commerce transactions during Thanksgiving weekend. According to Hitwise, Amazon accounted for 59.6%, 54.9% and 45%, respectively, of all Cyber Monday, Black Friday and Thanksgiving transactions in the U.S. this year, while by GBH's calculations, Amazon was responsible for 45% to 50% of Black Friday sales. By comparison, Hitwise found that Walmart (WMT - Get Report) , the second-biggest online retailer, accounted for 8.5%, 8.8% and 13.9%, respectively, of Cyber Monday, Black Friday and Thanksgiving transactions. And research firm eMarketer estimated earlier this year that Amazon -- both directly and via third-party sellers -- would account for 43.5% of total 2017 U.S. e-commerce gross merchandise volume (GMV). This column was originally published on Dec. 19. Amazon, as usual, isn't breaking out its Thanksgiving weekend sales. It did say, however, that Cyber Monday eclipsed this year's Prime Day as Amazon's largest-ever shopping day, and that Thanksgiving weekend sales of Amazon devices, which were heavily promoted this year, rose sharply. But while Amazon's holiday season performance might look like business as usual on the surface -- the result of promotions, adding more Prime members, getting existing Prime members to spend more and growing product selection with the help of third-party sellers -- some major changes have been happening behind the scenes. 1. Amazon seems to be getting more efficient at using warehouse workers. In 2016, Amazon hired 120,000 temp workers in the U.S. to handle holiday season demand, a 20% increase from 2015. But for the 2017 holiday season, Amazon kept its hiring plans at 120,000, in spite of the fact that its North American e-commerce segment has been posting 25%-plus sales growth even after backing out the Whole Foods acquisition. Amazon's ongoing hiring of full-time workers for its fulfillment centers likely has something to do with the lack of temp-worker growth. But with Jeff Bezos' company rapidly expanding its fleet of warehouse robots (it stood at 45,000 at the end of 2016, up 50% from a year earlier) and making other efforts to improve efficiency, hiring more full-time employees probably isn't the only reason. 2. Amazon is selling a lot more private-label goods than before. According to data from Quartz, Amazon sold 1,506 items under its AmazonBasics brand as of Dec. 12, up from 868 items in June 2016. Via AmazonBasics and other company brands, Amazon's private-label offerings, which are usually cheaper than rival items, now cover everything from consumer staples to furniture to apparel to electronics accessories. There's also, of course, Amazon's Echo, Fire and Fire TV consumer hardware lines, which are collectively seeing strong growth. In addition, many of these items are granted prominent placement on Amazon product search pages for common search terms, and just about all of them are eligible for Prime. In October, SunTrust analyst Youssef Squali forecast Amazon would sell $4.3 billion worth of private-label goods this year, up from $2.5 billion in 2016. 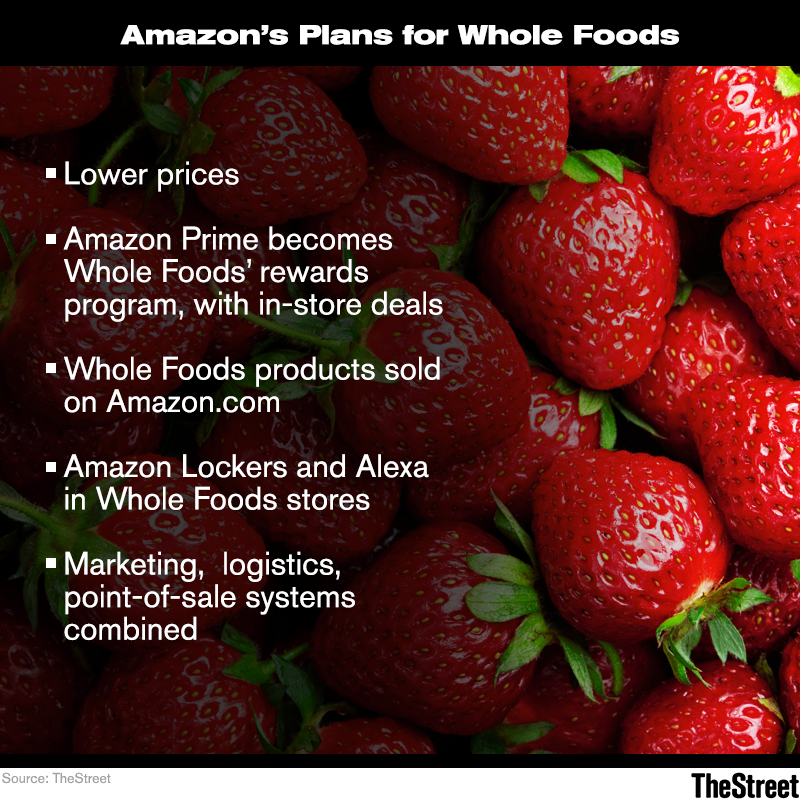 Whole Foods' private-label brands are expected to account for $700 million of that total. 3. Amazon's same-day delivery footprint has grown significantly. On Dec. 13, Amazon announced its same-day and one-day delivery services are now available in over 8,000 cities and towns. That's up from 5,000 earlier this year, and just 1,000 in June 2016. Clearly, Amazon's non-stop warehouse-building spree and logistics investments are helping the company expand its same-day and one-day footprints. Its GMV growth helps, too, by increasing the number of locations where the company is doing enough volume to economically support rapid-delivery services. Smaller rivals lacking such advantages will naturally be hard-pressed to match Amazon's same-day and one-day footprints, not to mention the reach of Amazon's Prime Now two-hour delivery service, which can now be found in about three dozen cities. 4. Amazon is more willing than before to buy Google ads to drive traffic. Relative to Walmart, Target (TGT - Get Report) , eBay (EBAY - Get Report) and many other rivals, Amazon has long relied less on Alphabet/Google's (GOOGL - Get Report) ads to drive traffic. And it has spent almost nothing on Google's very popular Product Listing Ads (PLAs), which feature a photo and price info and appear at the top of search result pages, as well as on the standalone Google Shopping site. But that seems to be changing a bit. For 2,500 popular retail product keywords, Hitwise believes Amazon accounted for 11.9% of Google search text ad clicks on PCs during Thanksgiving weekend, and 3.2% of PLA clicks. On mobile devices, the respective percentages were 9.1% and 2.9%. Those figures are still well below Amazon's estimated GMV share. And the tendency of many Amazon shoppers to bypass Google and go directly to its site or app to do product searches continues to make Amazon a large indirect threat to Google. But as far as Google is concerned, some business is better than no business. 5. Amazon might be getting less aggressive with its pricing. A price index of 59 popular holiday gifts monitored by price-tracking service Wikibuy found that Amazon's "all-in" prices on Black Friday and Cyber Monday were 11% higher on average than those of other top retailers. Data from e-commerce software firm Boomerang Commerce is more mixed, but does suggest some big-box retailers are more competitive with Amazon on pricing than before. Amazon, it should be noted, deems Wikibuy's figures "deeply flawed and misleading" (Wikibuy insists its data is accurate.). And the company both had plenty of Thanksgiving weekend promotions and benefits from how its third-party sellers compete to undercut each other. Still, considering how many Amazon Prime shoppers seem content not to look anywhere else while shopping just as long as Amazon's prices are reasonably competitive, it would hardly be shocking if the company eased up on its discounting for certain popular items. Jim Cramer and the AAP team hold a position in Alphabet for their Action Alerts PLUS Charitable Trust Portfolio. Want to be alerted before Cramer buys or sells GOOGL? Learn more now.